AudaFlow is a module for exchange of structured data between authorized parties in the claim on the AudaNet platform. AudaGlass is costing system for fast and accurate calculation of the cost of replacing or repairing windows on vehicles. Its database contains personal and commercial trucks and buses. Audatex company works closely with vehicle manufacturers and their official importers and with suppliers of alternative parts – glass on vehicles in the Czech Republic. The prices of spare parts in our database regularly updated by the current price list, we collect directly from them. The system does not use graphic templates, but only works with parts that are related to glass replacement. The selected glass into the calculations automatically adds the repair kit, mounting materials, labor and possibly sensor or the sensor gel. If the vehicle is not in the list of vehicles AudaGlassu, so there is the possibility of so-called “phantom” calculation. From the list, select the vehicle is technologically comparable parameters that are on offer and the relevant part of the program, enter information about the vehicle in which you want to replace the glass. Calculate the cost of repair or replacement glass will depend on your chosen vehicle. If necessary, it is possible to calculate the cost to repair the glass. The resulting calculation is then based on the number specified damage. Rapid and accurate calculation of the exchange front, side or rear window. Vehicle identification – not only through the glass VIN, but also by the Eurocode original part number. Labor and material for glass replacement by the manufacturer or a flat rate or by setting the organization. Automatic control calculations (the “Technical Report”) with a set of questions and answers. Electronic communication with insurance companies and services in real time. Ability to view history of damage and Statistics counted damage to the vehicles. Overview of your counted damage to the vehicle. Option to set their own conditions of the subject (hourly rate, discounts, etc.). Ability to generate invoices directly from the system (for services that do not have their own billing system) event. Interface to DMS (Dealer Management System). On-line solution: no installation, automatic updates, and the program is essentially continuously. Access to unique databases of glass under favorable conditions: the original glass, and their numbers, etc. AudaInsect (Electronic inspection) is a module supporting paperless inspection process directly from AudaPad. AudaMobile is an application for tablet devices providing access to platform services providing case management, vehicle identification, damage capturing, imaging and estimatic calculation services. AudaMobile is designed for the newest tablet devices available for OS: iOS, Android and Win8. Tablet devices contain e-mil, GPS and camera in one and enable cost savings on HW. It is very simple to get AudaMobile. In „App Store“ or „GooglePlay” look up “audamobile” and install the application by finger touch. Update of new version will be provided automatically without user´s assistance. 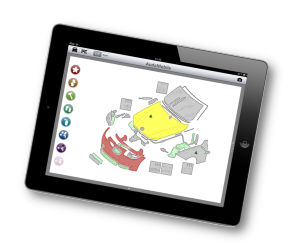 AudaPad is a vehicle damage assessment and claims management solution which underpins the process for all insurers and most of bodyshops in Slovakia and Czech Republic. Estimates are provided for the exact vehicle extra equipment included. Database for AudaPad solution is constantly updated and supplemented by new vehicles. It contains currently 1388 models and more than 20000 sub-models from 59 manufacturers, 22 UNITYPS included. Update is provided automatically 12 times a year without user assistance. AudaPad+ is enhanced version of AudaPad. 3D graphics and AudaIRE are parts of this service. AudaIRE allows you to use intelligent estimation by using AZT methodology. 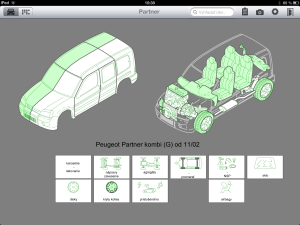 User only identify damaged area of the vehicle and defines repair difficulty. Then the system is able to count the time of the repair. AudaPDF is a simple tool that allows you to convert costing system AudaPad in PDF format. This transferred the calculation can easily be sent by electronic mail, and also prevent tampering with its contents. To work with PDF files require Adobe Acrobat Reader. For whom is the program designed AudaPDF?? AudaPDF is intended for all users of the system AudaPad and these are provided free of charge! Our company late last year launched a new service designed primarily for insurance companies, dealers and garages wrecks. It is an online platform AudaSalvage to which insurance companies demand placed on the purchase of cars, which for reasons of inefficiency repairs fall into the category of “total loss”. Authorized dealers – they are mostly traders wrecks and used vehicles, dealers of used spare parts or scrap metal dealers and service stations – AudaSalvage placed in their bids. After the auction insurance company selects the winning bid and the corresponding bid shall apply to claims settlement as “residual price”. The actual implementation of trade is then subject to agreement between the owner and dealer vehicle wreck. The benefit for insurance is quick and objective determination of prices remains low administrative costs.For traders, then the auction is a faster way to shipwrecks, availability 24 hours a day and get more chances wrecks. Platform is not open to the public and a range of partners from the ranks of the limited. Audatex is the most common system for calculating the cost of repairing damaged vehicles in the world. In the most advanced automobile “countries used car repairs, insurance experts and excellent quality Audatex. The advantage for you is that you can accurately calculate the cost of repair of a particular vehicle and not just a fictional type! Audatex knows all produced variants, which may be in one type of hundreds! You will always calculate correctly with regard to the variant of the vehicle equipment. Design specific vehicle and special equipment can have a significant influence on the difficulty and cost of repairs (eg different prices for spare parts). Calculated at Audatex vehicle is accurately described already at record damage. This will provide a detailed basis for calculating the optimum. The clear choice of options makes this process seamless. Damage is recorded directly in the graphical representation of the vehicle on the PC, laptop or mobile tablet. Unique graphics Audatex provides a precise definition of the vehicle and its affects all the details and the details of equipments. To forget anything, nothing confusing. Audatex is the mirror repair instructions from the manufacturers, so the work is described exact texts from manufacturers including numbers of jobs. Only in this way can be comparable and verifiable calculation. Unbeatable logic corrections from Audatex ensure that the account of the work involved. Also, duplicate repairs are eliminated. If it is however necessary, may also be awarded additional positions. The program simply thinks and works for you! Calculation of Audatex are so precise that “branded” repair all major manufacturers like to use this system. It is easier to work with than Audatex use information from the manufacturer or importer. Individual graphics Audatex provides the highest accuracy. A for “unbranded” repair is to use information from Audatex even greater. In addition to the current price of spare parts are available and also a number of his original text by the manufacturer. This eases the ordering of spare parts and provides control. Price part without numbers is rampant. AudaUpdate the system to automatically update the data and programs from Audatex via the Internet. Through the Internet also makes sending statistics and thus relieves the user concern with generating and sending statistical disks. Compared update CD, which are sent every two months, allows the system to be updated whenever a new version of the data or programs. Thus, even several times a month. Therefore, ensure that you are always working with the latest data and software company Audatex. On our web site we put the update files to update our data and programs. Program AudaUpdate Client that is installed on the customer’s computer, through the Internet for this update server periodically connects, sends him on statistics and determines whether to reside in the new update files. These new files are downloaded to the client computer and the process of updating data and programs. The volume of downloaded update files can be counted in tens of megabytes. In the case that in one branch and the local network is more AudaUpdate clients are downloaded to the same files repeatedly, and there would be a congestion Internet connection. In this case, we recommend customers to set up and install a local area network AudaSync server. AudaSync server is one of the tools of AudaUpdate. Its task is to synchronize content server containing update server Audatex. Transferring files over the Internet will therefore be made only once at AudaSync server installed at the customer. AudaUpdate clients local network then just get the update files from the server. Updating from a local network is much faster and does not overload your Internet connection. AudaVIN is a unique, automated vehicle identification service for exact identification of vehicle and factory fitted equipment at the time of manufacture based on VIN. AudaVIN service is integrated into the AudaPad estimation system. Currently available brands: VW ,Audi, Škoda, Mercedes-Benz, BMW, Mini, Smart, Jaguar, Seat, Mitsubishi, MAN, Fiat, Alfa Romeo, Ford, Porsche, Opel, Citroën, Dacia, Land Rover, Lexus, Peugeot, Renault, Toyota, Volvo, Lancia. For more information please clik on Vehicles . Zaměřujeme se i na méně frekventované skupiny vozidel – speciálně na nákladní vozidla, přívěsy, návěsy a přípojná vozidla, stavební stroje, motorky a čtyřkolky, a jiné.. Pro další info klikněte prosím sem.